In recent times, the standing desk has gotten increasingly common and the technological beauty locked within this masterpiece is being brought to limelight day by day. This is because quite a lot of people have gotten abreast of their ergonomic benefits and are willing to stake a lot of things just to get themselves one of these desks. It has been discovered that over 50% of major injuries from workplace result from muscular problems which were developed through prolonged uncomfortable sitting or unbalanced positioning while working. This has posed a series of health threats to people especially office and industry workers as many of them find themselves in the same particular position while working all day long. However, there has been a significant improvement as to how the technology of standing desk is being built today in order to help develop a fitting healthy working habit in the workplace. Therefore, when you set out to incorporate a standing desk technology into your workplace, soon you will find out the necessary accessories your desk should have for a complete ergonomic transformation. Hence, as beneficial as getting a standing desk is, so also is getting it accessorized so as to explore and bring your desk to maximum functionality and ultimately improve your office health. The following are the accessories which are must-have for your standing desk. An under-the-desk platform as the name implies is mounted under the desk. This accessory is meant to help you raise your keyboard to an ideal height needed for typing: your keyboard at the elbow height, your arms at a neutral position, your elbows turned at about 90-degree angle and your wrists straightened out for as long as you type. When this is not in place and the keyboard is not at an ideal height, you can develop muscle strains over time and the ergonomic purpose of the desk would gradually be compromised. Standing may be much of an activity than sitting and somewhat less of an activity than walking or running. However, standing while working may get the lower parts of your body fatigued. You would definitely develop aches in your leg, lower back, and feet gradually. 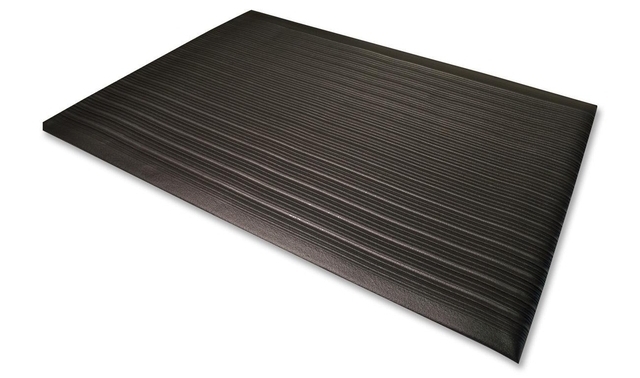 This is why you need the anti-fatigue mat. They have been built to provide a cushioning effect to your legs so as to feel less fatigued while you stand on it even for long hours. Your everyday working shoes may seem rather fit for moving around but for working at the standing desk, you will need something different. The entire weight of your body is resting downward on your feet whenever you stand at the desk especially for prolonged hours and your regular shoes may not be the ideal thing to wear at such times. Using a comfortable supporting shoe would provide appropriate support needed for your overall wellbeing. No matter how used to prolonged standing during the workday one might be, there are times when the need to rest comfortably cannot be substituted. This is exactly the point where you need active seating. These are simply stools and standing desk chairs that allow you to move while you sit. This is ideal for maintaining a good posture and keep you full of energy while you work. Active seating may involve the use of wobbly stools, balance balls, and several other seating accessories available. 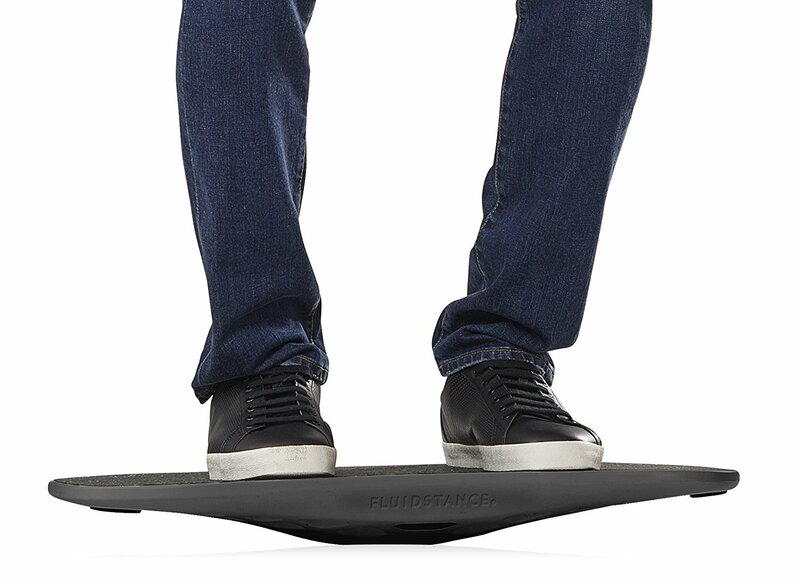 Balance boards function as though you are on a seesaw. They aren’t difficult to use. They provide a great level of engagement for your body while you work and keep you alert all through the time of use. This helps to keep your body balanced and relaxed while working at your desk. In addition, they help to ooze out any tension or pressure developed within your legs as a result of standing for long hours. It is an accessory to enjoy as they are fun to use. Foam rollers have been used by many for a good number of purposes but rarely do people use it to stand because they don’t even know. Foam rollers prove invaluable at a standing desk as you can use it to exercise your feet and also roll your arms over it to eliminate stress and stiffness. They come in different textures ranging from smooth to rigid surfaces. You would also find durable and extra-firm types. The position of your monitor should be directly in front of you with the center of the screen at the same level of your eye. Ideally, they do just what your keyboard tray is meant to do, except that for your monitor. If a monitor is placed too high or low or too sideways, you will have to constantly tilt your chin and may lead to neck strain. 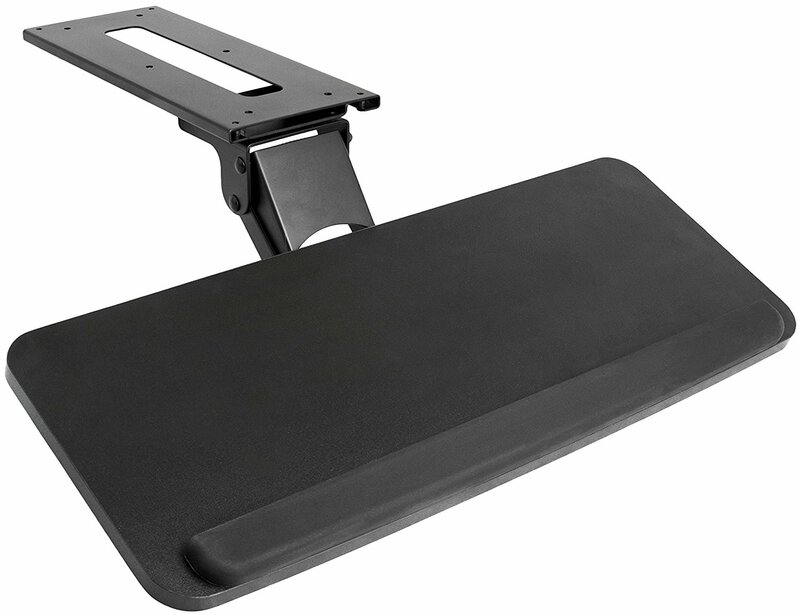 The monitor riser would allow you to place your monitor at a height which is ergonomic enough for you. The Under-Desk CPU Holder is also an important accessory that you can attach to your desk. There are a lot of benefits to having your desktop CPU under your desk. Even though some computer accessories most times are wireless especially with the advancement in technology, there are still instances where the need to run wires cannot be avoided. However, having your desktop CPU nearer to your monitor and keyboard helps to reduce the need to use longer cables. This would also help to avoid cluttering up spaces and allow for free air under your desk. It also helps the CPU to be properly aired so as to avoid the risk of overheating. If you wonder which kind of desk would be a perfect fit for your workplace, you should consider reading this post on “Recent Developments and Innovations in Standing Desk Technology” which gives an interesting highlight of different innovative desks which have been fashioned to perfectly adapt to your workplace and help maintain a healthy work posture. With the above and many more accessories, you can make your standing desk even more functional and as such a powerful technological tool in achieving a healthy workplace.